Our advantage is the people within our team. What does your 2018 tell you? Have you studied your 2018 to see what you can do in 2019? The trust you put in Google should not be the same when searching "Local Contractor" compared to "pictures of cats playing the piano". Talk to the people that have the best stories. When is the best time to paint your office? Read on to find out the best opportunity to paint and two reasons why you need to jump on this. Have you ever gone into a washroom where you are unsure if the door is actually locking? It is time to start over. Starting from the beginning. Not because we believe we have done it wrong, but because we believe we can do it better. Some paints don’t make the cut. How to change the world around you. Want to know how to change the world around you? What I learned from our Philippines Trip. Want to hear all about our Philippines trip. Here are all the details. How we helped the REVOLUTION! You can't have a revolution with an ugly floor. "With the way the year has gone, there have been times where I have felt that hardship of trying something new but also have experienced the highs of reaching goals and even exceeding them." Sometimes our clients need us in bright and early and sometime they need us there late at night. One of our favourite clients needed us in a Panago to paint some walls and have everything cleaned up and ready for their 11am opening. With absolutely no disturbances to the business or complications to the contractor, we got the two colors done in time for opening. 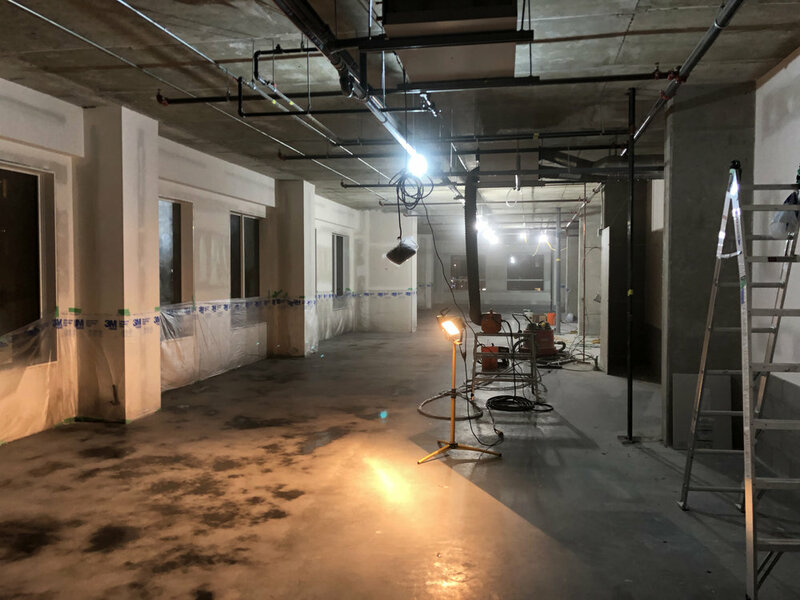 Last week on another project, we had to work late nights to prepare the concrete floors for a stained concrete coating that was to be laid down. The contractor was hoping we could do the work during the day, but things just didn't work out and we were required to work through the night to keep the schedule. That is what we do - what our clients need, we manage to provide. Sometimes we are all too eager to do things ourselves and try to save money doing things we may not be best at. Problem with trying to do things yourself is that you don't know the inside scoop on a lot of things. What type of roller to use, how to mud a wall properly, where to buy good quality paint for a good price. In the end, you are left with a job that you may not be that happy with and that has cost you more money in supplies than it should have and a lot of your time. We recently did a quote for someone and they decided to paint their house on their own. They asked us to come by and just paint the stairway for them and they told us the paint they were using. This paint was just from a box store and was more than double what we pay at our paint stores for high-end products. This customer just spent an extra $300-400 more on product alone. We don't discourage you from wanting to do it yourself, but when you think of what is really involved, it may be beneficial to have someone professional do it for you. There are other times when I have heard someone say, "Oh, I decided to paint the room myself. It only took me a few days." So much time wasted where we could have had the job done in a matter of hours. Making sure you know that you are part of the PE family. We are so excited to share... that we will be sharing soon! We have a project in the Philippines that we want you to be a part of. That's right, you can play a part in this project. We are just finalizing the details and as soon as we have them solidified, we will let you know about this awesome fun project. We are also opening up a new city! We have someone interested in developing Painters Enterprise in a city we have done some work in before. They understand the values and commitment that Painters Enterprise stands for and wants to be a part of. We are so excited to share this with you. Soon, very soon we will be announcing this. Preparing... Spring will come eventually. I know. Nobody is happy about what we see outside right now. We are all questioning why the man upstairs does not like us in this beautiful province of Alberta. But, we have to look at the glass half full, even if it is half full of snow. We all know that as soon as spring really hits, we have so many things we want to get done around the house and so many fun activities away from home planned with the family and friends. What a great opportunity now to make some plans instead of mopping around the day complaining about what it really should be like outside. What is it that you need to get done this spring/summer so that you can make sure you are out enjoying the fun activities of the season? Which tasks are you going to tackle and which ones would you rather hire out? It is all about how you value your time. Is it worth it to me to dig 10 deep holes for new trees in my backyard when someone else can do it in an hour or two for a small price? I remember my brother in law deciding to paint his fence on his own with a brush and roller. He called me after finished a quarter of his fence which had taken him the better part of a day. Deciding that he didn't want to spend another 2 or 3 days doing something that would take someone with a sprayer and some experience only an hour or two. Who do I need to contact so that I can spend my time on more worthwhile items? If you need a connection made, let us know. Need a fence built? We know several contractors, deck and fence builders to help you. Need a sprinkler system put in your yard? We know a great plumber that can help. Moved into a new house and need the landscaping taken care of? We can connect you with someone. And if you need any staining or painting done, we would be more than happy to help. Start planning now, because we all know how busy we and others get once the nice weather arrives. An eye opener to me. Marketing will tell you that you need to find something that you can do that will make you stick out from everyone else. They say that you can not be successful unless you are unique. Lately, I have been thinking what it is that separates us from the many, many painters that are out there. We have been successful in what we do and we have clients that have been around for 13 plus years. What is it that makes them want to stick around and continue to use us as their main painters? I could just easily say that it is our exceptional customer service, it is the people that we have within the company that people love working with and this is why we have clients call us every week asking for more work. And it is for this reason that they call us but, let me tell you a story about the last time I was in Calgary visiting with Kevin Bullock our Calgary Manager to really show you how true this is. We were visiting a Second Cup that we were working on with one of our favourite contractors. I had driven up in hopes to capture video of some spraying of brick that was supposed to have been installed the day prior to my arrival. I had left Edmonton at 5 am so that we could do some filming before the other contractors arrived on site. Well, the brick didn't get done so we had nothing to film. So, we decided to run to another nearby project as we had been told that the diffusers had been installed in a t-bar ceiling and thought "let's go video that". We arrived at that site and surprisingly nothing was ready again. Disappointed, we decided to run back to the first site and talk with the contractor on when they may be getting the brick done in hopes that we could still do some filming that day. We discussed things with the site manager and unfortunately, things wouldn't be ready in time that day. One of Kevin's painters was in need of a couple supplies so we decided to run that errand. Now, this is what caught my eye. Yes, we could have been angry and given it to the contractor that things were not ready for us and that we had wasted a morning. But do you know what Kevin said to the site manager before we left? That right there was an eye opener to me. I realized that this is why our clients like us. We are not only concerned about what we need to get done but we care about you and what you need. True, this is simple but when was the last time your painter asked you if you needed anything before they left?